The issue of bullying is all over the media these days, and for good reason—it has been ignored for much too long, and it needs this momentum in order to really cement itself as a serious problem that plagues our society. Goodness knows how much I was bullied growing up and the effects it had on the rest of my development. There are many celebrities and campaigns that are currently addressing this issue. One such campaign that is gaining traction is standtogether.tv. The main motivator of this movement is that the website assigns each participant a serial number, which he or she then prints out onto a sheet of paper. The participant then submits a photo of themselves holding their serial number. 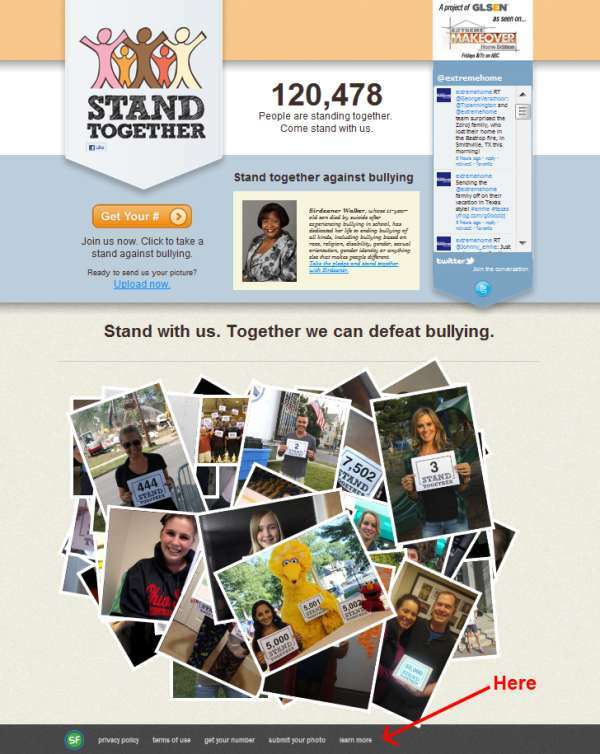 There are currently 135,000 people “standing together” against bullying, and that number is growing steadily. When you visit the website, you will find plenty of resources around the print-your-number activity. What you won’t find are solutions to the problem of bullying. I had to scroll to the bottom of the site, and the very last tiny link was to the “learn more” page. Raise awareness on the overwhelming number of bullying incidences in the U.S. I find all these goals to be distressingly superficial. Just as you can’t cure a disease by fighting the symptoms of the disease, I don’t believe attacking the problem of bullying head-on will have any desirable result. Bullying is a symptom of greater problems surrounding the life of the oppressor. Criminalizing the act of bullying isn’t going to change that person’s life or their susceptibility to act in those negative ways. What it will do is increase the numbers of criminal records. I just don’t believe that talking about “the act of bullying” is going to change any child’s susceptibility to those acts, especially when that child still holds the prejudices/negative emotions/apathy that’s contributing to his inclination to act that way. The only true solution to the problem of bullying is the one our society doesn’t want to face: moral education. I know this is anything but simple, but it is the only ideal that isn’t a cop-out. Children need to grow in an environment where positive virtues are nurtured, and good deeds are valued. The playground culture itself needs to be shifted towards the good. Children should grow to understand how rewarding it can be to have positive interactions with their peers. It’s only then that we’ll see real, authentic changes to the issues that impede the younger generation. I am so glad that I’m not the only one who can’t find anything particularly useful on these websites!